A long-standing challenge in material design is to overcome the conflict between strength and toughness, because they are generally mutually exclusive. To address this challenge, we rationally design cellulose-based nanopaper and investigate the dependence of their mechanical properties on constituent cellulose fiber size. 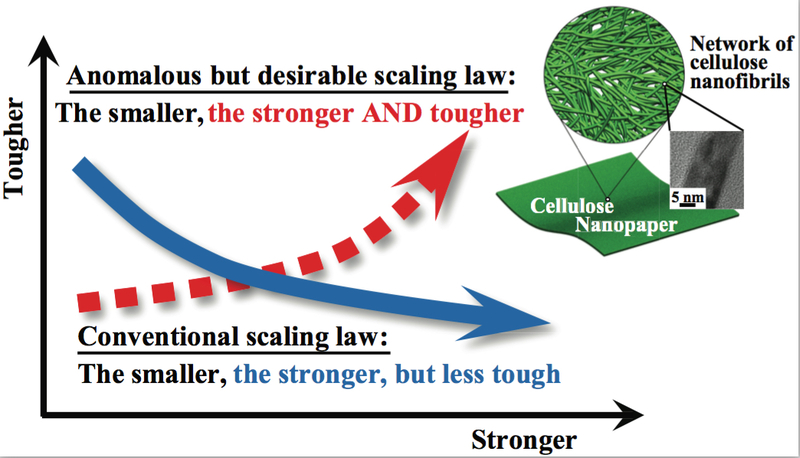 Surprisingly, we find that both the strength and toughness of the nanopaper increase simultaneously (40 and 130 times, respectively) as the average diameter of constituent cellulose fibers decreases from 27 μm to 11 nm, suggesting the promising potential toward an anomalous but highly desirable scaling law: the smaller, the stronger and the tougher. There are abundant opportunities to use the fundamental bottom-up strategy to design a novel class of functional materials that are both strong and tough.